Supposing you have a legal case and need some very important text messages on your iPhone, you have to print them out for evidence. Or you have some text messages that are really crucial to your business and you need them for negotiation. How can you make it? 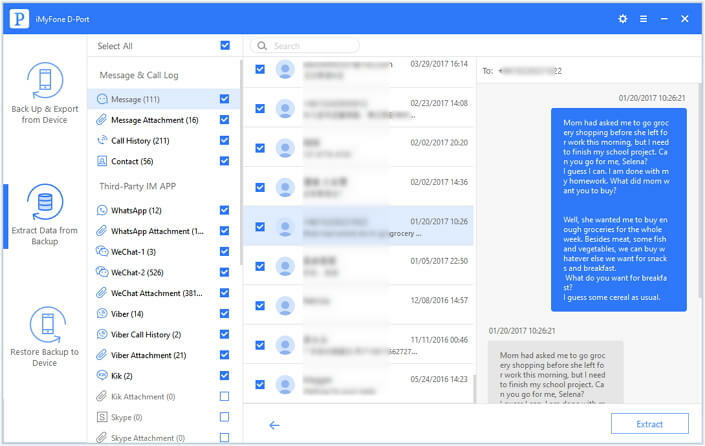 If there are just a small amount of the messages, you can take some screenshots, and then forward them to your email address or print them out using AirPrint printer. But if there are a lot of messages needed, that’s not a good idea anymore. 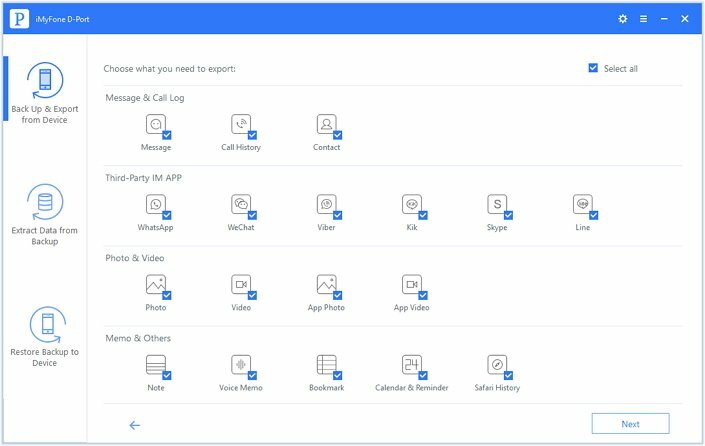 A better way is to use a third-party tool which is professional in exporting the data on iPhone to computer so that you can easily print them out. iMyFone D-Port iPhone data exporter can be your ideal tool to do this job. 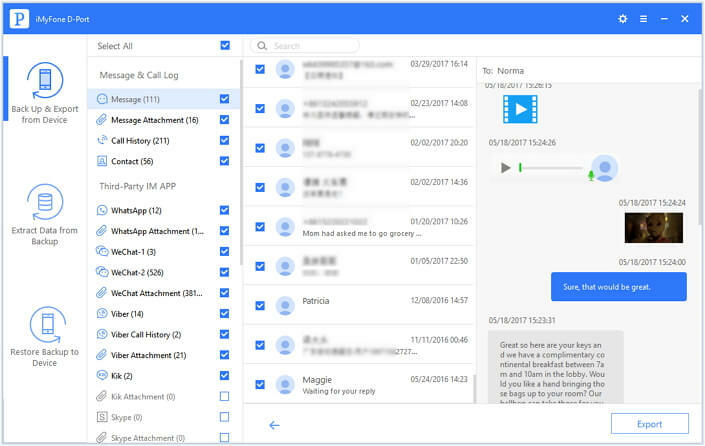 It is a powerful and helpful program which gives you the ability to preview the messages in detail so that you could precisely print the text messages you need from iPhone 7/SE/6s/6/5s/5c/5/4s/4 or iPhone backup files. 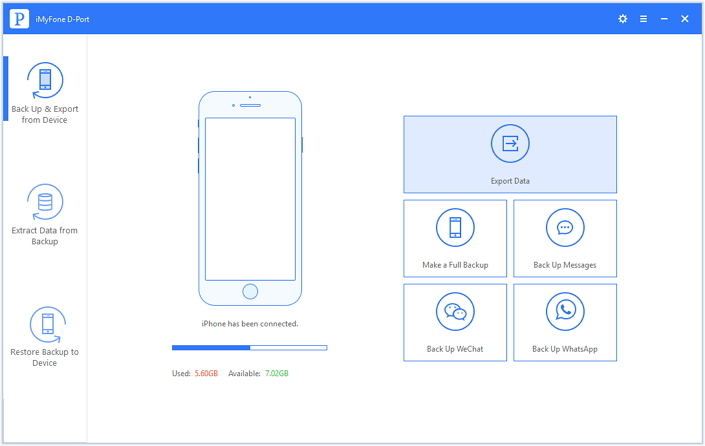 Supports to extract data from iOS devices, iTunes backup or iCloud backup. You can extract only the data you need instead of restoring the whole backup with iTunes/iCloud. Supports almost all iOS device such as iPhone 8 and iPhone X running iOS 11 and more. Here we are going to tell you the 3 easy ways to print text messages from iPhone. 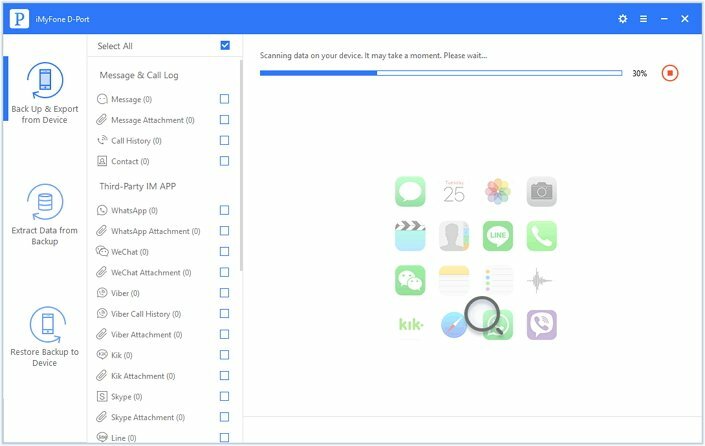 No matter your iPhone running iOS 11, or your backup files created for iPhone running iOS 11, the program can extract text messages from them. Step 1: Download and install iMyFone D-Port on your own computer. 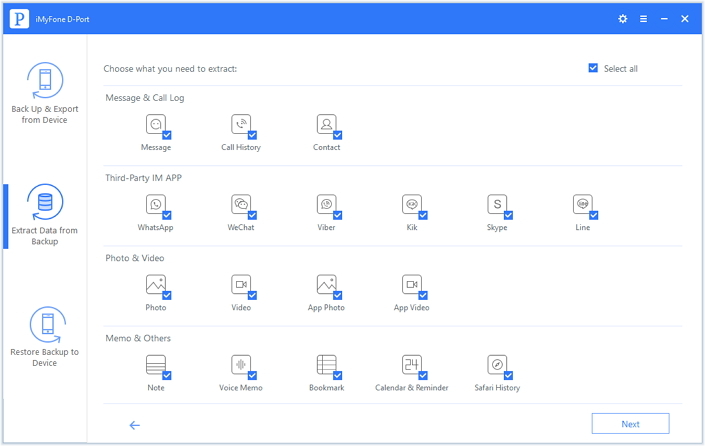 Choose "Backup & Export from Device" on the main interface and Choose the "Export Data" option. Step 2: After that, you need choose the file type that you want to print. Select "Message" from the list. Step 3: You will be asked to connect your iPhone to your computer. Once it is done, simply click "Next" . The program will start to scan your iPhone. Step 4: Finally, after the scanning, all messages on your iPhone will be shown in the result, it is possible to preview texts. Simply choose the ones you desire to print, and hit the "Export" button to save them to your computer. Now, you can print the text message(s) from your iPhone effortlessly. 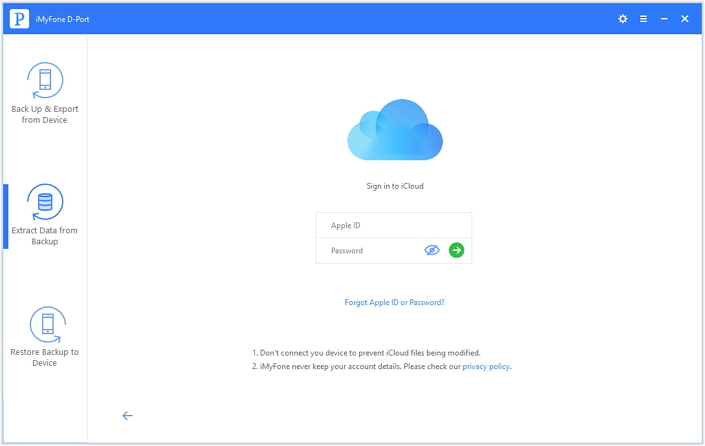 Once you have set up your iCloud properly from the first boot of your device, iCloud automatically stores a duplicate copy of your important files and documents on the cloud storage given to you by Apple. 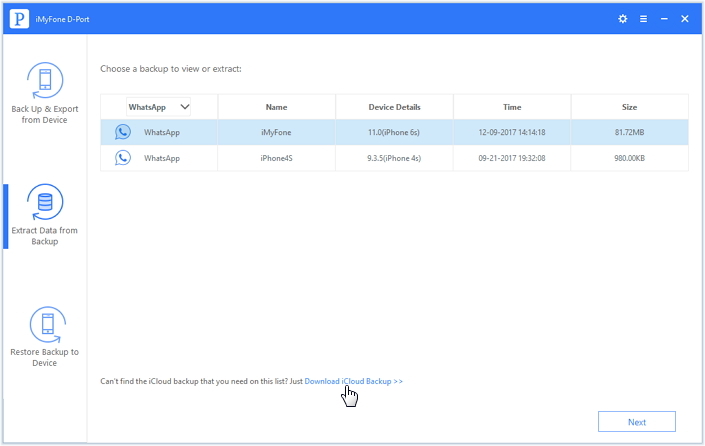 iMyFone D-Port is able to export the message(s) stored on your iCloud backup in a format that can be printed. Read on! Step 1: Launch iMyFone D-Port software and click on the "Extract Data from Backup" tab. Click the hyperlink "Download iCloud Backup" . Step 2: You’ll be required to login to your iCloud account. As mentioned earlier, this process makes use of your already-stored iCloud backup. No need to worry about your personal information here since iMyFone D-Port will not record any of your account information. Step 3: At this stage, you'll see the backup files in your account after you enter your iCloud account information. 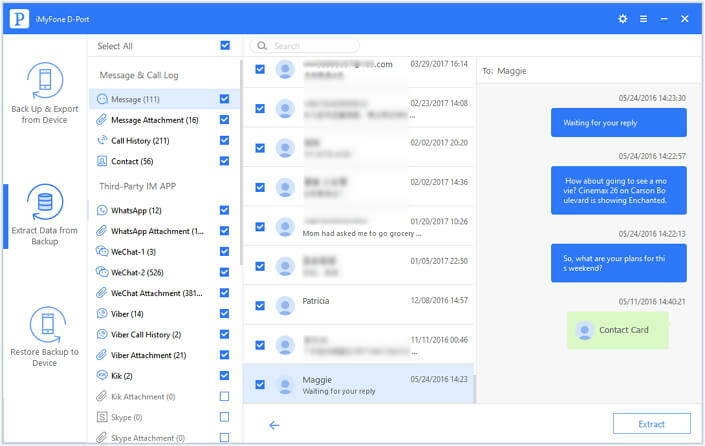 Select the one that contains the text messages you want to print. Then click "Next" at the bottom right corner of the screen. Step 4: The next step is to select "Message" option and leave the rest unchecked. Then please click "Next". Step 5: After the download is completed, you can preview and choose the messages that you want to print. Click on the "Extract" button and wait for the process to complete. Locate the exported file in the directory on the computer. Note that the exported file will be saved in an HTML format which can then be opened by any web browser and then printed from there, just like any other web page. Step 1: Choose "Extract Data from Backup" tab, and then choose an iTunes backup which contains the message(s) you are looking for and then click "Next". Step 2: Tick/Check the "Messages" option (since we want to print out messages). Leave the rest unchecked and then click "Next". D-Port will start to scan your iTunes backup for all the insides messages. Step 3: After the scanning process is completed, choose the messages you need print and tap on "Extract". They will be saved in an HTML or xls format on your computer. You can easily print them out. Overall, iMyFone D-Port takes off the stress that you were supposed to pass through while trying to print text messages out from your iPhone or any other iOS device. Go ahead to have a try! How to Fix “My iPhone Deleted All My Messages” Issue?